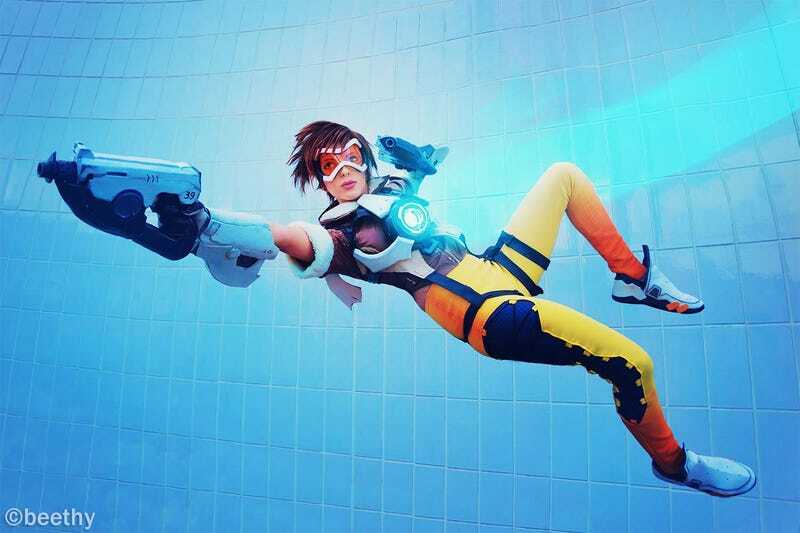 This is Yasemin Arslan—who does not have big arms—doing a hell of a job cosplaying as Overwatch's Tracer. You may notice, though, that she's kinda floating in the air. Like magic. How'd she pull this off? "PhotoShop, duh" is only half the answer. The other half is the way Arslan and photographer Beethy staged the shot. I love it. It's everything that's awesome about cosplay: there's super-professional work in some parts, while in others, there's bootstrapping DIY when you just need to get the job done. The very helpful gentleman on support duties is Zeek, who also cosplays. You've seen before, dressed as...Misty. Kind of looks like Misty has been working out, huh?